Welcome to the beginning of the summer season here in Puerto Vallarta! In these days the sun is a little higher in the sky and lingers a little longer everyday. With these longer days the waters of our world famous fishing grounds increase in both temperature and in current activity with changing current directions which is normal for this time of the year. The result of these seasonal changes is naturally a transition from winter to summer species in and around the Bay of Banderas. 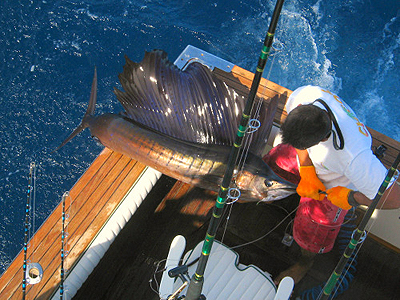 Sailfish, Dorado and Marlin are starting to move into the area. Fishing can be a little frustrating as with breeding season here, love is in the air so your bait may not be as interesting as the lady fish grabbing their attentions. But no worries, they’re no all in the mood for love at the same time. This means with tourism in transition as well you can have our renowned fishing grounds almost to yourself, a real luxury! For those who are not interested in fishing, the city is yours, no crowds at the hotels or restaurants. Puerto Vallarta, the Emerald Playground is yours for the taking. If this is your first introduction to P.V., welcome, the fun is about to begin!